The Armed Services Vocational Aptitude Battery or ASVAB is designed specifically for those who are in the process of enlisting into the America’s military. Its purpose is to, first of all, gauge whether the applicant has what it takes for a military career and life and, secondly, to determine what their job will be while they are in service. Recruiters are tasked with making sure that every military applicant meets all the requirements for the branch he or she is enlisting in. Once the preliminary requirements are met, they can and will schedule you to take the ASVAB. This will further either confirm or deny your application into military life, as well as dictate your possible career path during your time in the Armed Forces. There is no fee to take the battery. Most likely you will take the ASVAB at one of 65 Military Entrance Processing Stations, commonly referred to as MEPS. At a MEPS you will take a CAT ASVAB, meaning that it is done on a computer. However, not everyone may live in close proximity to one of these sites. Therefore, MET or Military Entrance Test sites have been set up in places that are not near to a MEPS. If you test in a MET site, you will most likely be taking the battery using paper and pencil. Your recruiter will notify you of where you will be taking the exam and how you will taking it. Firstly, you must arrive early or on time to your testing site on the day of your scheduled ASVAB. Tardiness is not tolerated in the military and will not for its exams either. If you are late, you will not be allowed to test that day and will have to reschedule with your recruiter. You will be required to bring a valid government issued identification the testing site to allow entrance. The test does not require you to bring any personal testing, study, or other materials with you. Calculators are included in this and will not be allowed to enter the testing area. The Word Knowledge subtest belongs to the Verbal domain. This section will test ability to select the correct meaning of a word presented in context and to identify best synonym for a given word. It is made up of 16 scored questions. You will be given only 8 minutes to finish this subtest. 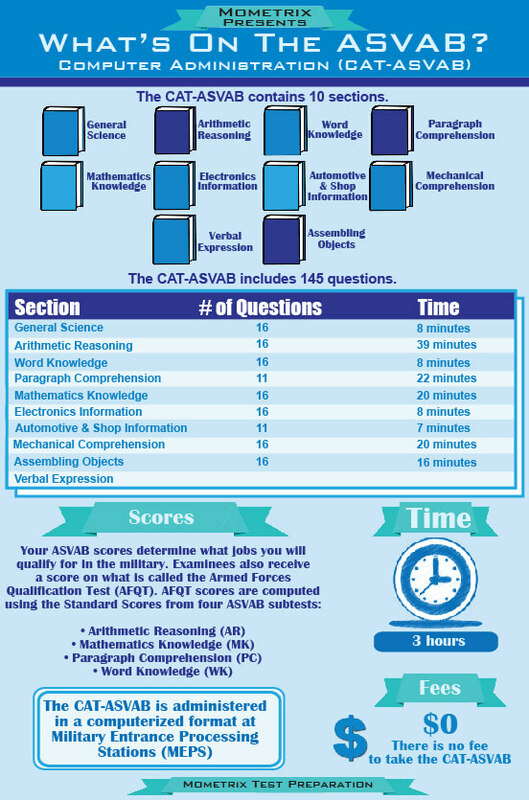 There are 10 subtests on the ASVAB with a total of 145 scored questions. You will be given nearly two hours to finish the battery if you testing with a computer. However, it is important to note that paper and pencil exams have more questions but still need to be finished in about the same amount of time. If you are testing on a computer, you will be allowed to work through the test at your own pace, moving on to the next subtest when you are ready. This may allow you to finish in a much shorter time than you are given. However, with a paper and pencil exam, you must for instructions before moving on. If you are taking the computer administered test, you will be given your scores upon completion at the testing site. However, if you are taking it with paper and pencil, your exam will have to be sent to a MEPS to be scored. Once it has been graded, your recruiter will be notified as to when your results will be available. 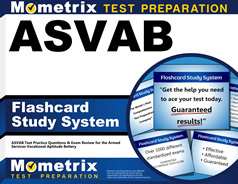 Here at Mometrix Test Preparation, we have prepared a study guide and a set of flash cards for the Word Knowledge subtest of the ASVAB, as well as all the other subtests. These are meant to give you the subject matter you will be tested on in clear, meaningful ways that will help to prepare you for the exam. The ASVAB Study Guide and ASVAB flash cards will also include sample questions that are designed to be just like the ones you will see on the battery itself. With these in arsenal, you will be more ready and able to take on this exam and know that you have done your best. Be sure to give both the study guide and the flash cards an opportunity to work for you. 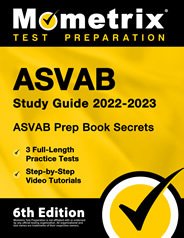 Mometrix Academy is a completely free ASVAB test resource provided by Mometrix Test Preparation. 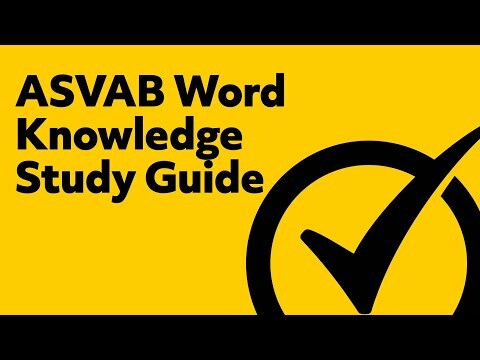 If you find benefit from our efforts here, check out our premium quality ASVAB Study Guide and ASVAB Flash Cards to take your studying to the next level. Just click the ASVAB study guide link below. Your purchase also helps us make even more great, free test content for test-takers.